The Simple Pass "MPLS SDN World Congress 2014" includes: Access to the MPLS SDN World Conference (Joint sessions with NFV & SDN Summit on Wednesday, March 19, 2014), access to the exhibition and interop event; coffee breaks, luncheons, welcome reception and conference proceedings of MPLS SDN World Congress 2014. 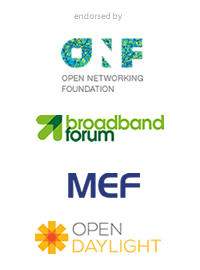 4-Day Event Pass includes Broadband Forum Tutorial and MEF Carrier Ethernet Tutorial. The Simple Pass "NFV & SDN Summit 2014" includes: Access to the NFV & SDN Summit 2014 (Joint sessions with MPLS SDN World 2014 on Wednesday, March 19, 2014), access to the exhibition and interop event; coffee breaks, luncheons, welcome reception and conference proceedings of NFV & SDN Summit 2014. 4-Day Event Pass includes ETSI/ NFV Workshop and ONF/SDN Workshop. The Simple Pass "V6 World Congress 2014" includes: Access to the V6 World Conference, access to the exhibition and interop event; coffee breaks, luncheons, welcome reception and conference proceedings of V6 World Congress 2014. The Pass "Plus MPLS SDN World + NFV & SDN Summit 2014" includes: Access to the MPLS SDN and NFV & SDN Summit (Joint sessions Wednesday, March 19, 2014) , access to the exhibition and interop event; coffee breaks, luncheons, welcome reception and conference proceedings of MPLS SDN World and NFV & SDN Summit 2014. 4-Day Event Pass includes Broadband Forum Tutorial, MEF Carrier Ethernet Tutorial, ETSI/ NFV Workshop and ONF/SDN Workshop. The Pass "Plus V6 World + NFV & SDN Summit 2014" includes: Access to the V6 World and NFV & SDN Summit (Joint sessions with MPLS SDN World on Wednesday, March 19, 2014) , access to the exhibition and interop event; coffee breaks, luncheons, welcome reception and conference proceedings of V6 World 2014 and NFV & SDN Summit 2014. The Triple Pass "MPLS SDN + V6 World + NFV & SDN Summit 2014" includes: Access to the 3 conferences, MPLS SDN World, V6 World and NFV & SDN Summit (Joint sessions MPLS SDN World and NFV & SDN Summit on Wednesday, March 19, 2014) , access to the exhibition and interop event; coffee breaks, luncheons, welcome reception and conference proceedings of MPLS SDN World, V6 World 2014 and NFV & SDN Summit 2014. For all registrations cancelled before February 18, 2014, the registration fee will be refunded in full. All registrations cancelled after February 18, 2014 and before March 5, 2014 are subject to a € 250 administration charge. Registration fees for cancellation received after March 4, 2014 must be paid in full. For grouped registrations please contact us directly as special reductions might be applicable. To benefit from special conference registration fees, you must use the link and password provided by the person within your company, who is in charge of the event.